Charming, Fully Remodeled Home Less Than Two Blocks to Main St! This little Victorian is even better than "good as new!" The Juniper Berry has been completely rebuilt from head to toe, featuring a new fully stocked kitchen, comfy beds, and all the amenities you could wish for! Two queen bedrooms, two twin beds, and two 3/4 baths equals plenty of space for up to six guests. There's lots of room at the dining table for fresh meals or game nights. Modern additions like a smart TV and laundry allow you to make yourself at home. Local excitement is right out the front door thanks to Juniper Berry's central location, like race start/finish lines and parades down Harrison Avenue. You can walk to coffee shops, the train station, yoga studio, skate park, restaurants, bars, and museums! You'll love the small mountain town atmosphere, and coming back home to this cozy & thoughtfully appointed abode to relax. Parking: Although not guaranteed, this home has room for approximately one car to be parked on-street in front and two more cars in the back, off-street. 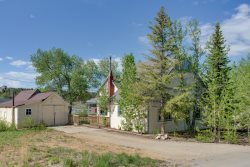 Leadville’s Victorian homes were historically built quite close together in the days before the “horseless carriage.” As such, parking can sometimes be a challenge. In the winter, maintaining an open parking space can cost homeowners a significant amount of money and/or hours spent shoveling. Please take these things into consideration as you plan your trip, and be courteous to your local neighbors by trying to park directly in front of the home you have rented.